To perform a windows profile backup, to be more exact a windows user profile backup on windows 7 you have to use the Windows Easy Transfer from the Windows Start button -> All Programs -> Accessories -> System tools -> Windows Easy transfer. Or press the start button and then type “easy transfer”, this can be used to migrate the user profile from an old windows machine to a new one. 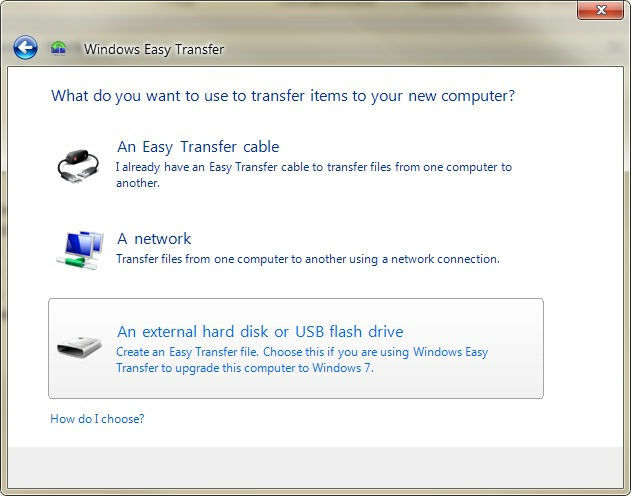 Start Windows Easy Transfer and follow the wizard to perform a user profile backup. 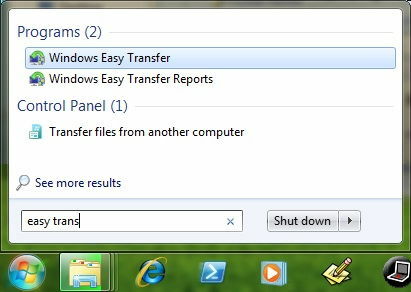 Windows Easy Transfer is a great tool because it will automatically backup all your user profile files and settings and files without adding the temp files or the temporary internet files thus keeping the user profile as small and possible, and in one single file. The disadvantage is that you can’t have access only to certain files within the backed up user profile, like the Desktop, Documents or Favorites. To have access to independent files within a windows user profile backup we have to perform a manual user profile backup where we save the Desktop, Documents, My Pictures, My Videos, downloads, My Music and Favorites. 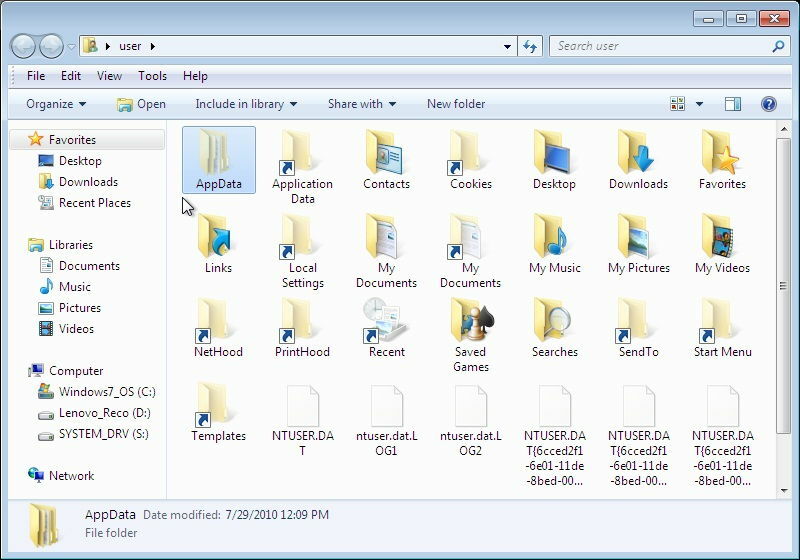 Other folders might exist within your user profile folder, for that you have to browse to it and see which user profile files and folders you would have to save next to the ones mentioned above. In the image below you can view how to find user profile folders. 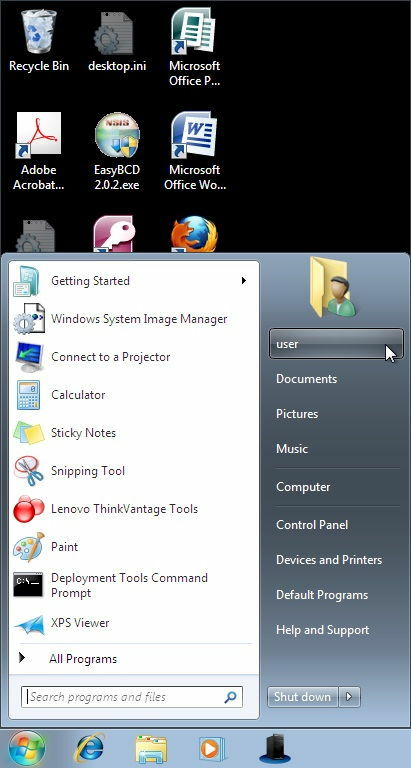 Just click your user name and you should find all the folders specified before which come as default with windwos 7. In addition you might find other folders, one very important folder which is also hidden comes by default with windows is called AppData Folder. This folder contains a lot of settings, but it also contains many unnecessary files which tend to take lots of space. So to understand what to do in about this specific folder you should read the User Profiles Windows 7 clean up user profile. Because you need to save space, because user profiles can get quite big, especially if you have the tendency to put everything on your desktop. In the image below you can find a typical windows profile folder. The faded items within the windows profile folder are hidden objects, and in your case the setting might not be enabled to see them. 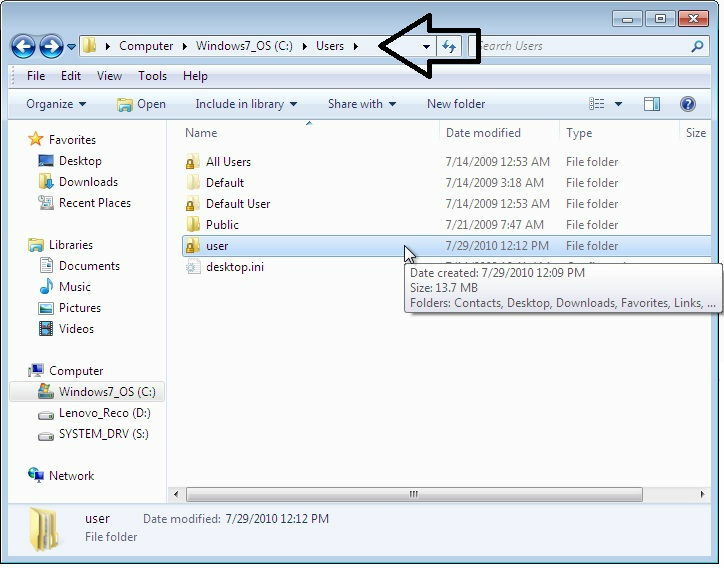 to enable the setting you have to use the link to User Profiles Windows 7 clean up user profile and learn how to show hidden files and folders. You can see in the image also the AppData folder. In the image above we can see on the bottom row second from the left, the NTUSER.DAT. This file contains your windows user profile settings. This file is a registry hive, and if you are curios about this file you can search more online and fine the registry explained. Perhaps there will be a post on the registry in the near future on The Computer Manual Blog. If you want to do a complete manual windows profile backup, you have to read the post mentioned above on how to clean up a user profile. To make sure that none of the files are locked when we do a manual windows 7 profile transfer, we have to log out the user profile which needs to be backed up and then log-in into an Administrative account. This means that you have to create another user account in control panel and make that account an administrator. In addition you need to know that the user profiles in windows 7 are located on the C:\USERS. To get to this location just browse the computer from the start menu then the C:\ drive and then the users folder. in that folder you should find the folders of all user accounts including the one you want to back up. 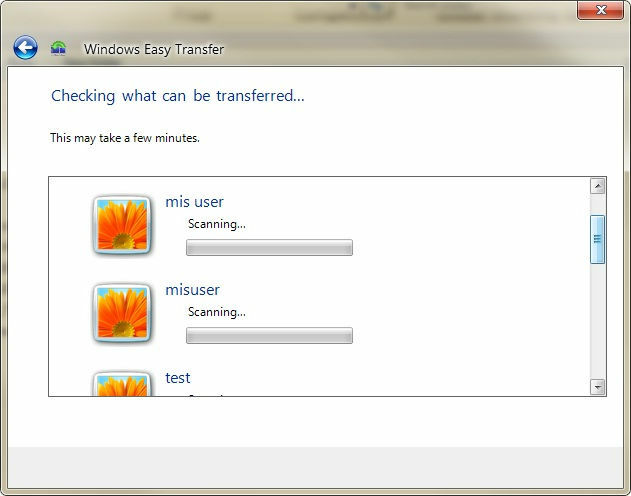 Now we have to move to the Windows Easy Transfer which can be used for user profile transfer and backup. Let’s fire it up and follow the images just click next on the Welcome screen so we can get to the bread and butter of the windows user profile backup. 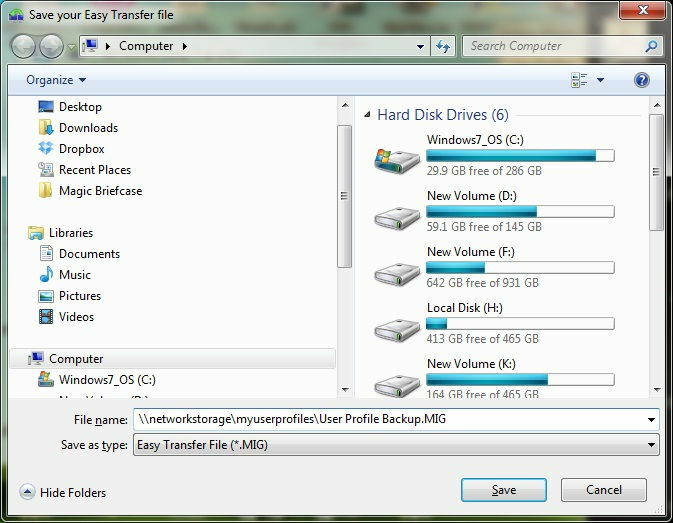 Just choose the third option an USB external Hard disk or USB flash drive to do the windows profile backup. Even if you intend to place the user profile backup file to a network device it will still work. We are going to use a UNC path to find the network location where to store the user profile. 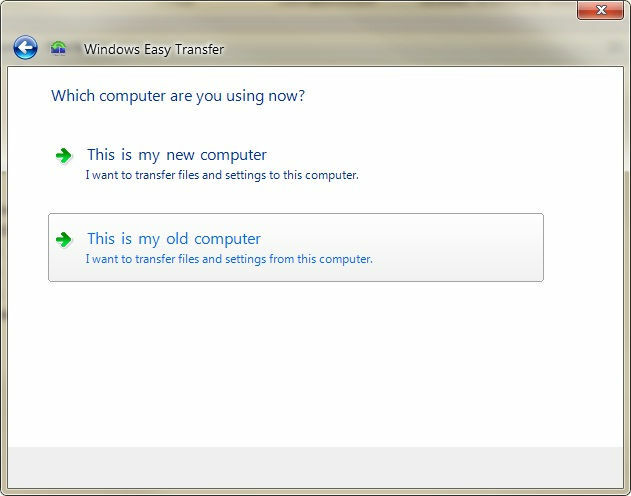 Select “this is my old computer” to have the Windows Easy Transfer tool scan your computer for exiting windows user profiles. To restore the user profile files you select: this is my new computer. Once the scanning finishes, you will have the option to select which user profile you want to transfer or backup. Remove the check-marks on all other user profiles and only save the one you need to transfer. Don’t password protect your user profile unless you know that your information is that vital and people would be interested in stealing it. But in that case you should have a paid person dealing with this. Move to the next screen and click save the save dialog window is going to pop up and ask you where you want to save. here you can choose any hard drive, USB flash drive or the network. In the image below the example shows you in the file name box an UNC path pointing to the network. but if you just want to save on a regular hard drive, then click on the hard drive available to you browse to the folder of choice, name your file and hit SAVE. To restore your user profile files you just double-click the file you just save and follow the wizard. But in this instance you will select “this is my new computer”.